Does this color make me look too pale? This dress is a “Poison Green” dress– one that has been dyed with an arsenic-containing chemical dye. Scheele’s Green and Paris Green were the premier green pigments of the late 18th and early 19th century. Their bright, rich color enchanted fashion and interior designers and they used the colorants on everything from curtains to candles. The pigment is made from a variety of compounds, but the ingredient that everyone zeros in on is copper arsenite, which, as you probably guessed by the name, contains arsenic. 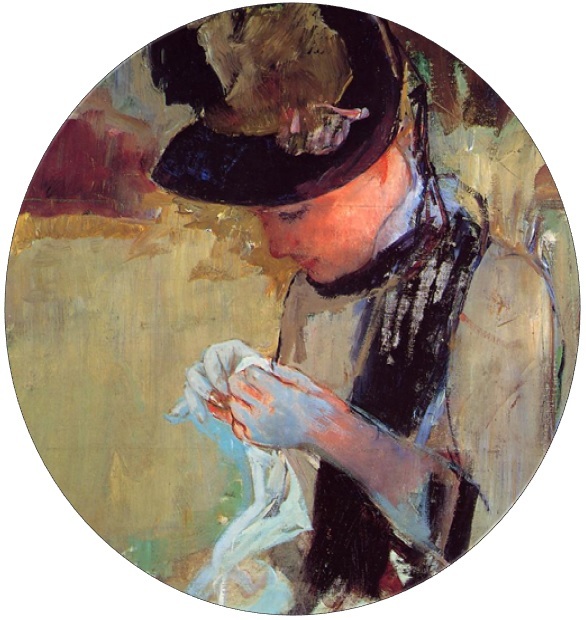 The factory workers, dyers, and artisans that produced arsenic-infused items frequently suffered from arsenic poisoning. Painters, for example, would get sick from ingesting the paint on their brushes. How? They used their lips to get a sharp point on a paintbrush (this also caused lead and radium poisoning in many paint workshops). Scheele’s Green was reported to have killed children who ate sweets colored with the dye and was especially nasty when it was added to flocked wallpaper which flaked into dust. Throughout the 19th century, lurid tales of dresses dyed with the arsenic-infused Paris and Scheele’s Green poisoning people filled magazines and newspapers. Scheele’s Green was also used to make silk and paper flowers that were popular as wreathes and headdresses in the mid-19th century. Arsenic-laced dresses, however, were hardly the worst of the Victorian’s worries. Arsenic was a major problem in an era when chemicals were being created and sold on a larger scale than ever before. 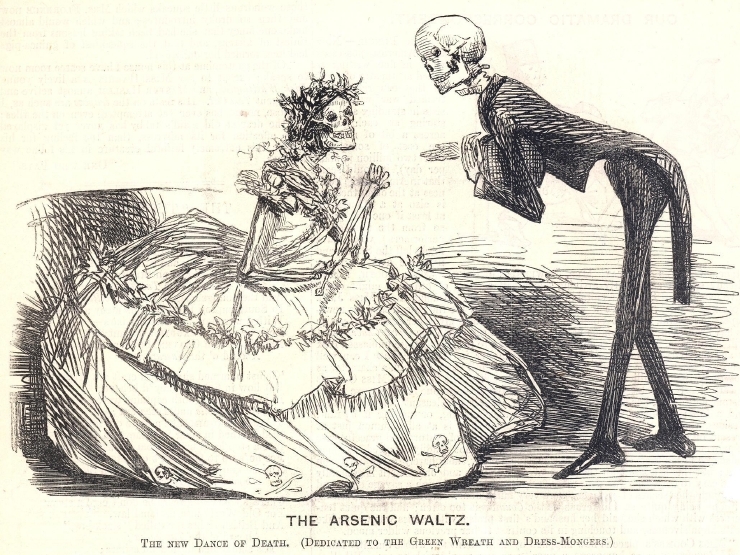 Victorians had genuine reason to be wary of arsenic! In a world where hundreds of similar-looking white chemical powders were common, even one mislabeled jar could mean the difference between an uncomfortable mouthful of chalk or a gruesome death. In one terrible accident in 1858, a confectioner mistakenly used 12 pounds of arsenic in his sweets, poisoning himself and 200 others and killing 20. It became clear that arsenic needed to be much more tightly controlled. However, regulations did not fully pass until the late 19th and early 20th centuries and arsenic-laced paint continued to be produced well into the 20th century. In reality, arsenic poisoning occurred frequently in the past because arsenic was found everywhere in pre-20th century life, not just in poorly regulated dyes. Some uses were obviously problematic and unsafe: for example, arsenic had been a popular cosmetic ingredient since ancient times, despite its known toxicity. “Safe” generally mean that the compound contained less than 1/10th of a gram of arsenic. Otherwise, it would be labelled as poison. But our ancestors were not blind to the fact that arsenic could kill—many notable cases of deliberate arsenic poisoning are blotted throughout history. Still, like many potential deadly compounds, small doses of arsenic would be used to treat diseases as a form of chemo therapy. Arsenic trioxide (the same compound from the 1858 candy poisoning) was used historically as a treatment for cancerous growths and it is still used to treat certain forms of cancer today. It was also used to treat syphilis. Disease was the number one killer in Victorian society. The role bacteria played in the spread of disease had not yet been directly proven, nor had the antibiotic penicillin been discovered. Cancer then was just as frightening and even more deadly than it is today (Warning: link contains graphic images!). Everyone was eager to find cures for deadly diseases, so they experimented with different chemical combinations in an attempt to survive. Arsenic and many other chemo therapy drugs are quite poisonous which is exactly why they work to kill cancerous cells. They may be deadly, but if monitored carefully, they can save lives. Each pill in this bottle is 10mg, or about 1/10th a lethal dose. 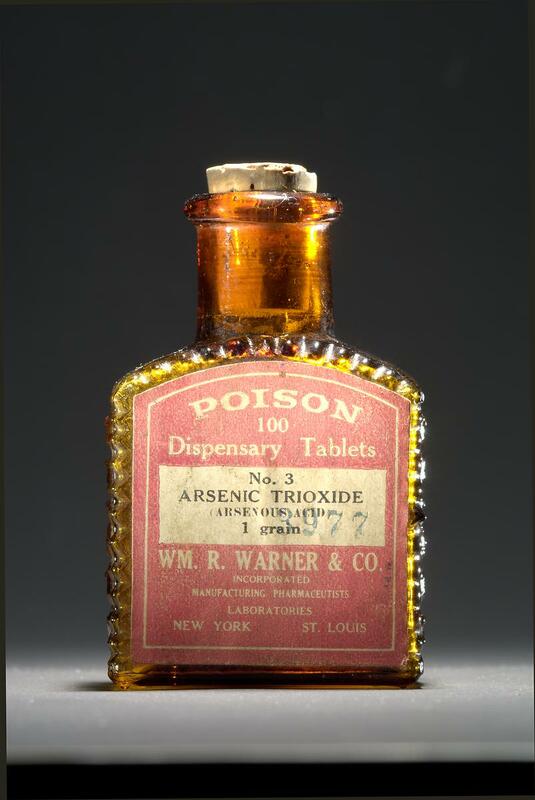 Arsenic medications were woefully under-regulated in the 19th century, but was plentiful, which led to a rash of poisonings both deliberate and accidental. Unsubstantiated home remedies, self-medication, and cases of mistaken identity were the cause of most arsenic deaths. In addition to exposure through human-initiated means, naturally occurring arsenic in drinking water is found around the world, including all American drinking water, especially in the Southwestern United States (Where I grew up in New Mexico, the water is frequently very hard and contains many potentially harmful substances like radium and high concentrations of fluoride). Victorians didn’t have standardized drinking water parameters regulated by agencies or advanced filtration systems. Many Victorians used hand-dug wells, natural springs, or local creeks as their main water sources, many of which contained arsenic. Depending on their location, their water could contain enough arsenic to be harmful after long periods of time. The increase in gold mining activities during the 19th century lead to further contamination of drinking water, thanks to gold’s nasty habit of hanging out near arsenic-containing ores. Many miners and pioneers in the western United States were affected by arsenic-contaminated water from mine runoff. 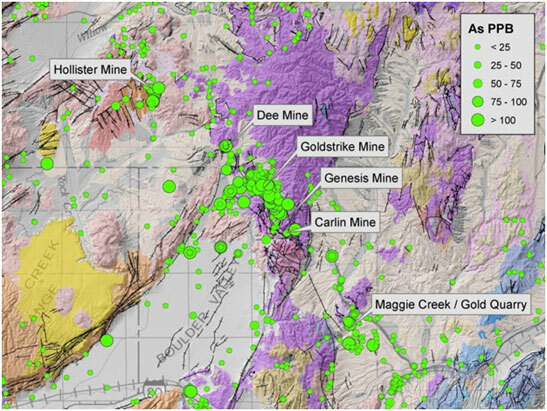 A modern map showing the levels of arsenic in the groundwater surrounding Nevada’s gold mines. While the arsenic was already present in the ground water before the mines, mining released more arsenic into the environment, a problem we are still dealing with today. Other sources of arsenic include many foods like leafy greens, rice, and seafood which naturally accumulate arsenic over time. You are exposed to and ingest arsenic everyday, too, but thanks to modern laws and regulations, you don’t experience anywhere near the amount of exposure our ancestors did! Arsenic poisoning is a matter of quantity. Unless you get a massive dose all at once from a jealous rival or by drinking paint, any arsenic you are exposed to generally gets filtered out of your body within a few days. In order to get a lethal dose, a human has to consume or absorb between “70 to 200 mg or 1 mg/kg/day” or be constantly exposed over a long period of time. There is some truth to the Poison Green dress tales: People with sensitive skin could experience skin irritation due to either the arsenic, copper, or other chemical compounds present in many mid-19th century aniline dyes. Despite what all those complexion-clearing lotion ads say, topical arsenic poisoning produces nasty wart-like eruptions on the skin. A report done in the 1890s revealed that about 20% of dress goods (fabrics for clothing) contained more than 3mg of arsenic per meter. If you figure in that the average dress takes 7 meters, the average daily dose received from the most poisonous of dresses , which turned out to be a red and black, is 21mg– quite a hit! Indeed, most reports of people becoming ill because of fabric and papers are associated with deep blue and red colors, not green. The green gowns likely got their ill reputation because of the the pigment’s name “Paris/Emerald/Scheele’s Green,” when in actuality, any color of dye could contain arsenic compounds. In addition, there were still plenty of green dyes that did not use arsenic at all. This dress was dyed with arsenic green. Please do not lick it! Stockings, on the other hand, were a bigger problem than dresses. Many contained more arsenic than dress goods and since they were worn directly on the skin, they led to far more illness. The paper flowers used to decorate such gowns were dangerous because paper goods often contained far higher amounts of arsenic than fabric goods. In “The Yellow Wallpaper” by Charlotte Perkins Gilman, a women is locked in a small room in order to cure her “hysteria,” but the woman only grows more nervous, paranoid, and unsettled. She becomes obsessed with the yellow wallpaper in the room in which she sees shapes and people. The story ends with her crawling in circles around the room, wearing a groove in the wallpaper as she goes around and around. Her condition likely was not helped if the wallpaper contained high levels of arsenic, which would have made her feel even more ill and often produces delirium and shock in acute cases. The majority of sufferers were not the high-class women wearing the gowns, but the lower class factory workers, painters, wallpaper installers, and laundresses who spent long hours exposed to the chemicals in a time before safety equipment and monitoring. When combined with the many other sources of daily arsenic exposure, it invokes a sense of wonder that anyone could survive the Victorian era at all! It makes you feel lucky to live in an era when the Pantone Color of the Year won’t send us to the emergency room! while these tales are true, you must remember that life is full of dangers and we are not immune simply because we no longer have to worry about the same troubles as our ancestors. Thanks to their experiences and resulting advances, we are able to live somewhat safer lives than they did, at least as far as arsenic exposure is concerned. We’ve traded that risk for others our Victorian predecessors never dealt with: cars that kills literally MILLIONS of people every year, electricity everywhere, mobile phones that distract us to death, automatic rifles firing 800 bullets a minute, a rise in severe food allergies, nuclear weapons, and, let’s not forget, that lead paint is still a thing. However, just as you go about your daily life despite these risks, so did our ancestors. Just as you know to avoid driving recklessly or sticking a fork in an electrical outlet, so our ancestors tried their best to avoid making deadly mistakes. Many of our risky behaviors are slow killers, though. Perhaps future generations will look back at our microbead-filled shower gels the same way we look back at arsenic face wafers and cringe. If you have a Paris or Scheele’s Green gown in your collections or are visiting one in a museum, the actual risk posed by the arsenic levels in the dress is small so long as it is not frequently handled. Green dresses are one of the least harmful of the arsenic-treated items out there, but since such dresses were the most public and visible objects, it was easy to sensationalize and satirize them, enforcing the memorable image of a frivolous woman and her willingness to suffer ill-health for the sake of beauty. Exposure to arsenic pigments certainly wasn’t a health-conscious choice, but a woman in a green gown wouldn’t melt like the Wicked Witch or fall dead in the streets. Such tales reflect more on Victorian morality and condemnation of fashion and female vanity than they do on historical fact. However, if you have your heart set on a green Victorian dress, you should probably stick with a modern, non-arsenic based green. Sometimes sacrificing historical accuracy in favor of modernity has its advantages! Many of these “deadly fashion” stories served to ridicule fashion or exaggerate a few incidents into an epidemic rather than portray accurate fact. However, we do love a good horror story that makes our modern world seem safer than “back then,” so such stories keep getting circulated. Eventually it becomes difficult to discern what’s truth and what’s been tacked on for shock value. Historical sources can contain mistakes and new research often disproves historical “fact.” I try to do as much thorough research as possible, but sometimes I miss things. In this case, it’s difficult to tell how much of the 19th century research publications are accurate. Measurement systems, contaminated equipment, even instances of bad math (I found a few instances where the numbers in charts did not match numbers in the text) can all muddle a report. We cannot go back in time to double check their sources and methods! The best way to get an accurate picture of the past is to research, research, research and take nothing for granted! Fascinating, thanks. I didn’t realise other colours could be more toxic than the green. You mention candles, which reminds me of something I remember vividly from a childhood visit to a living history museum (I forget which one). They were demonstrating candle dipping and told us that miners were issued with green arsenic dyed tallow candles to stop them eating them. I was shocked that anyone could be so hungry they would eat a candle, even one made effectively of lard rather than paraffin wax. Thank you for clearing up so very much. I remember when I first heard of “poison green” dresses. I found them fascinating. Stepping back to look at the larger picture and science is quite helpful. Your mention of flowers as well as the information the link provided, has me wondering about possible effects on milliners. Fascinating story on arsenic colorants! Who knew!? Oh there is a chemist hiding inside of you. Now you can write about indigo dyes, azo dyes, or cochineal dyes. Wow, this information is astounding. Thank you for the post. I paint and dye Silk, and this makes me thankful for all the Artisans that have gone and died before me, all in the name of fashion, but the knowledge gained through them is priceless. Pingback: A Beleza na Era Vitoriana – Parte II | Beleza e o Alternativo em História e Presente para junkies. Reblogged this on Dark Moon Series. I have a cape that may be arsenic green. Would like to know how to authenticate it and/or what to do with it. You might try taking it to a textile restoration/conservation expert in your area. They could test the fibers to see if there is arsenic present. Not all green items are arsenic based, so the only real way to tell is by a quantitative chemical analysis. I believe I have a cloak that could be arsenic green…it is green! Would really like to know who to contact and how to move it. 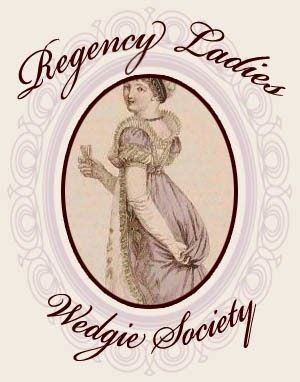 I am doing research for a paper on arsenic in clothing in the 19th century. This was really helpful to give me some background! Since my paper is on how women self-sacrificed themselves in pursuit of the fashionable (eg. through wearing arsenical dresses) I have come to realize during my research that I might be wrong and that the message of my essay may be incorrect which can not be good. As a result, I was wondering if women knew that the dresses had arsenic in them and knew of the factory condictions the women making these dresses had. I was also wondering if dresses with arsenic in them were an expensive status symbol. I was reading a journal on the subject of arsenical dresses in the 19th century and it said that arsenic itself was relatively inexpensive. Does that mean that arsenical dresses were too or was it expensive and exclusively for the wealthy? Thank you so much for your wonderful blog and thoughtful research! It sounds like you are on the threshold of a very exciting paper! People were well aware of the possibility of arsenic poisoning. The “Arsenic Waltz” cartoon, for example, is from Punch magazine and was published in the 1850s– however, many such sources blamed the women wearing the tainted goods rather than the source: manufacturers. So a woman choosing a bright green dress might have read an article somewhere and known brilliant green dyes were arsenic-based, but it’s highly likely that she did not. Even our modern clothing labels tell us only the fiber content of our clothing, not the chemical content of the dyes used to color them. Women did not seek out arsenic-based dresses because of the arsenic content, but because of the wonderful colors that had previously been difficult or impossible to produce in fabrics. That was what made Sheele’s Green so popular: it was the first time fabrics and papers could achieve such a brilliant green color fairly inexpensively. Before that, green fabrics were often expensive and not very colorfast because they were created by using plant-based dyes or by layering yellow and blue dyes. Arsenic was cheap and plentiful, much like the poor, often immigrant, labor used to manufacture it. Without lab equipment or knowledge of a factory’s manufacturing processes, telling an arsenic-dyed black fabric from a non-arsenic-dyed one in a shop would be impossible. Chemistry is a constantly expanding science and we are still learning new things about old chemicals today (think about the bans on asbestos and CFCs which were thought to be miraculous chemicals until the ill-effects finally got enough study and attention in the late 20th century). We can’t judge Victorian women for dying of arsenic exposure any more than you can judge 1950s women for raising their children in lead-painted, asbestos-lined homes. They lived in a world were the flow of scientific information was not instantaneous, widespread, or cheap on the TV and internet. Many didn’t know of the danger and those that did might not have the means to escape it: A subsistence farming family in an old house painted with arsenic green might not be able to afford to repaint. A factory worker in an 1840s paper flower factory, for example, might have to choose between blistered hands and starving to death. Did women know of the poor conditions of workers? Certainly, as we do today. There were very clear class lines in the 19th century. Some women sought to help these workers as well as they could, considering women had no right to vote in the 19th century, so their voices were not as easy to make heard on the public, political platforms. It wasn’t just women suffering from arsenic, either: Black stockings were one of the biggest offenders and those were a common article worn by everyone–men and woman alike, and wallpaper affected entire families. It was ultimately stockings and wallpaper that lead to the regulation of arsenic. So on a surface level, we imagine a haughty debutante choosing a brilliant green dress purely for its beauty, despite knowing that it contained arsenic, and we get a bit of smug schadenfreude when her creamy decolletage breaks out in boils or, highly unlikely but more poetically, she drops dead on the dance floor. But much of that speaks more to human nature’s cruel tendency to seek self-righteousness through the condemnation of others than it does to the actual actions and mindsets of Victorian women. I explained it once to a friend in terms of sunscreen: We know that sun exposure can cause skin cancer. Yet have to have PSAs reminding people to wear sunscreen to prevent cancer because, quite frankly, it’s quite easy to forget if you do not get into the habit or don’t spend a lot of time in the sun. In addition, there are sunscreens may not offer the SPF protection they advertise. So if you don’t wear sunscreen everyday and you get skin cancer, did you deserve it because you might have prevented it? What if you never wear sunscreen and never get skin cancer..does that mean the research lied? And if you wore sunscreen, but the SPF level was wrong, who is at fault if you get skin cancer? The manufacturer for not assuring the quality of their product or you for not doing you research into safe sunscreen brands? And if you properly wear the ideal sunscreen and never get skin cancer, does that mean that you are a better person than the others? Did fashion kill people? Sometimes it did. However, I have found that it wasn’t the fashions themselves that killed people, but the demand for certain goods and the lack of manufacturing accountability/regulations. The arsenic was the direct cause of death for many, but their exposure was caused by the lack of safety or concern on the part of their employers, coupled with ignorance of the overarching nature of the situation. Wearing a green ballgown might not be a death sentence, but working in the silk-dyeing industry might be. Arsenic isn’t the only danger in fashion: Think of all the factory workers like the seamstresses of the Triangle Shirtwaist fire who were locked in to maximize their work time or the 20th century Radium Girls who died so people could have glow-in-the-dark watches. It’s still happening today, we’ve just hidden the horrors away across the ocean in countries that have labor laws that match those of our 19th century. While we glorify designers and expensive couture fashion houses, the average garment factory worker has been overlooked and undervalued since the invention of factories. Would a middle-to-upper-class Victorian woman care about the plight of a factory worker exposed to arsenic in the name of beautiful papers and cloths she would wear? I can’t say. That would be where I would start your research. The realization that is beginning to dawn on you also dawned on me, prompting me to write the original post. All of the information I had ever heard about arsenic (and corsets, for that matter), had always been the sensational, Ripley’s Believe-it-or-Not style blurbs about how horribly vain and clueless our ancestors were. But the more I study and live, the more I learn that the danger was very real, but the way we have interpreted the tragedies are wretchedly skewed and often cruel. We make the same sort of mistakes our ancestors did– we just have more information available to use now, creating a lens that makes their lives seem so dark, dirty, dumb, and abstract in comparison to ours. In some ways it was. In some ways it is much more complex than a shocking little blurb on a webpage can express. Thank you for humoring this fanatically long reply. This is something I contemplate a lot. I cannot claim to be an academic, scholarly source, but I am warmed knowing that my writing in some way has helped expand your research horizons. Sometimes the cracks in a theory lead to even wilder, deeper, and more fascinating discovery than we ever dreamed of (or desired). It’s not that your original thesis was incorrect–women and men alike still make somewhat questionable sacrifices for fashion and always have– it’s just that you get a better view when you zoom out and start seeing the context around those choices. A single tree or event a hundred trees on the side of the mountain is not the mountain. I wish you the best of luck and an exciting journey with your research paper! May your mind always learn and your heart always grow! Thank you so much for providing me with all of this useful information. My research paper has to be on any example of destruction in art. I decided to change my original idea to something similar but a little bit more accurate thanks to your research! My new idea is on how factory workers health when producing arsenic dresses was damaged because of the desire for the new and exciting. Thanks again for all of your help! I could not have done it without you!